Modern industrial interior design is one of the fastest growing trends and it isn’t only in warehouse and loft apartments that we’re seeing the style. The approach is all about proudly displaying the building materials that many try to conceal, honing focus on the raw, unfinished look with wood, metal finishes and utilitarian objects. For homeowners who love industrial décor, we’ve assembled together the key aesthetic traits. 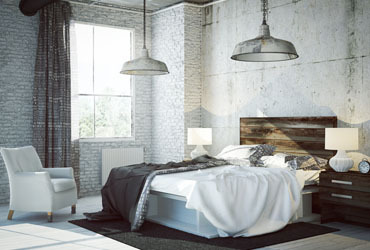 Here’s our take on styling rustic elements with modern touches for an industrial interior. Earthy tones and the factory feel are key elements in industrial design and its important to feature a plethora of wood and metal surfaces. Exposed brick lends itself to the trend and can either be left raw or painted dark grey or chalk white for a distinctive effect. Decide from the outset what colour and tone you want for walls and floors then build a colour palette around that. For a rustic effect, install a concrete floor or concrete effect tiles as opposed to carpet. A kitchen with stainless steel counters and hanging metallic light fixtures will showcase style, creating the ambience of a commercial space. For dining areas, opt for either a wooden table with metal legs or a wooden table with metal chairs to generate authenticity in design. Limit pattern in favour of block colours and add warmth with warm toned metals and textured soft furnishings. Exposed pipes and ducts are a signature feature in the industrial approach. Many modern homes are designed from an architectural perspective to hide these details. You can, however, interpret this characteristic by incorporating a steel metal staircase with bars. This will appear particularly striking against hard wood flooring. For rooms that need some warmth and comfort, such as lounge areas and bedrooms, choose a soft woven or fluffy rug to produce this. Rugs that feature an interlace of metallic hues make a prominent statement. Maximise the appearance of high ceilings with tall living plants. Not only do plants brighten up cool toned interiors, they also add functional benefits for physical and mental wellbeing. Stainless steel is undeniably featured in many industrial homes. Incorporate this metal in the hardware used on doors, cabinets and drawers. Follow a coherent style throughout the home by adorning doors with authentic stainless steel door handles. A duo finish offers layers of visual depth whilst providing a solid feel in the hand. Another key trait in industrial décor includes metallic finishes and features. Out of all the key traits listed, this design element is easy to embrace. Decorate rooms with plenty of metal weaved into furniture, ornaments and wall pieces. For a kitchen with dark blue or grey counters, select copper kitchen appliances to complement copper cup handles to open kitchen cupboards and drawers. With the popularity of copper soaring, you’re certain to find many pieces on the market. Incorporate these few key traits for the industrial trend with our range of high-quality products that excel in both aesthetic and performance. For more interior inspiration, check out our previous blog The Madness of Mixed Metal Interiors!